John A. McLean is Stevenson Professor of Chemistry, Director of the Center for Innovative Technology, and Deputy Director of the Institute for Integrative Biosystems Research and Education at Vanderbilt University. Prof. McLean completed his PhD at George Washington University in 2001, where he made significant contributions in plasma spectrochemistry in the development of new technologies for the analysis of complex and limited radionuclide and biological samples. He then performed postdoctoral research at Forschungszentrum Jülich in Germany and then as a postdoctoral at Texas A&M University with Prof. David H. Russell in biological mass spectrometry. Working with David Russell, he constructed ion mobility-mass spectrometers capable of broad-scale analyses of complex biological samples, termed ‘integrated omics,’ on the basis of both molecular structure and mass. 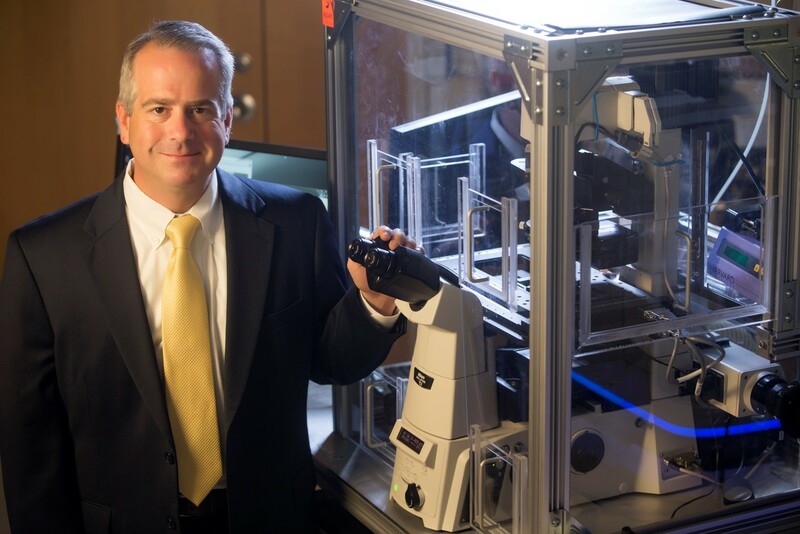 In 2006, Prof. McLean was recruited to Vanderbilt University where McLean and colleagues focus on the conceptualization, design, and construction of structural mass spectrometers, specifically targeting complex samples in systems, synthetic, and chemical biology as well as nanotechnology. The mass spectrometry technique allows researchers to identify 10s of thousands of different molecules in a sample in a fraction of a second. His group applies these strategies to forefront translational research areas in drug discovery, personalized medicine, and ‘human-on-chip’ synthetic biology platforms. Prof. McLean has received a number of awards, including the Agilent Thought Leader Award, Waters Center of Innovation, Excellence in Teaching Award from the student members of the American Chemical Society, a Defense Threat Reduction Agency Research Award, an American Society for Mass Spectrometry Research Award, a Spectroscopy Society of Pittsburgh Award, an R&D 100 Award, and the Bunsen–Kirchhoff Prize from the GDCh (German Chemical Society), among others. He has published over 150 manuscripts, book chapters, and patents and serves as an Associate Editor for Nature Molecular Phenomics and on the Editorial Boards of several leading scientific journals. Advanced technologies allow us to measure all of the molecules in a biological system in a matter of seconds. Using tools developed in other fields such as the finance sector, astronomy, and physics have opened many opportunities using biological big data. The development of humanlike miniature organs in synthetic biology to new drug reservoirs in extremophile organisms like bacteria provide new directions for understanding and harnessing biology in medicine and drug discovery.